But today I finally have some pictures of my bathroom! It's a pretty standard space housing a shower, toilet and sink. I especially love all of the finishes (they were here when I moved in) and the sink to ceiling mirror. The one negative is that storage is pretty limited. I have space under the sink, but that holds my cleaning supplies and trash can. I was getting tired of storing my hair supplies on the hutch in my bedroom, so I hung two IKEA spice racks. Now my hair sprays, conditioners, mousse, etc. have a permanent home in the bathroom...where they belong. This little shelf came with me from my grandfather's house and it fits perfectly right above the toilet. One of the first tips I remember hearing from Nate Berkus was to "containerize" anything and everything you can! So I did just that! I have my Tylenol, aspirin and vitamins displayed in little IKEA spice jars, with the bottom of each jar marked with the name of the pill and expiration date. This is definitely my favorite thing about this room! I love how clean it looks and since I don't have a medicine cabinet...it works perfectly! I also really love the sink! Surprise, surprise....it's from IKEA, too. So there you have it! My sweet and simple bathroom. As you can see, there is a lack of surface space but that works out being a good thing because it forces me to keep things clean and tidy! 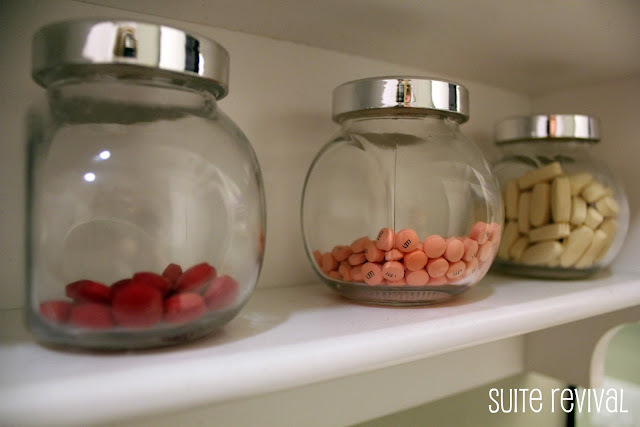 Your bathroom looks cute..and your pills now look just like candy. Hopefully you never have any little kids that can climb come to visit! Thank you! And definitely...my place is a kid-free zone! I love this post! Only thing is, as much as love IKEA, the closest one to where I live now is like 4 hours away! Not worth it! But I could probably make those for just as cheap. No, cheaper because I will get about four out of the materials I bye! Just a thought to anyone devoid of IKEA! Your little jars are so pretty, and I sympathize with having no medicine cabinet. Consider, though, that many medications (or even cosmetics, etc.) deteriorate in sunlight. how did you attach the spice racks to the wall? I need to do this in my bathroom! They have a two little holes in the back so I put just two screws into the wall (with an anchor) and then hung the rack on the screws. This is a great idea! 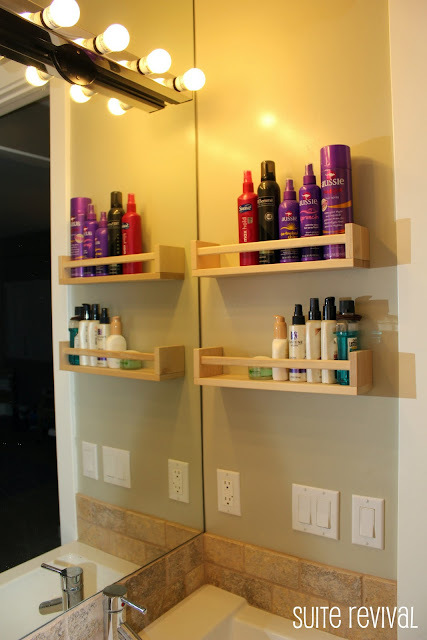 My fiance actually made me 2 shelves based on this idea but didn't think about how to attach them to the wall! (They're currently still sitting on the floor!) :) I'll be sure to tell him about the screws! Thanks! My bathroom is also very small and this is a wonderful idea. Your bathroom looks very sophisticated. Where did you find the mirror and lights? Thank you! I'm pretty sure it came from Ikea, although, I rent so I'm not 100% certain. Where did you buy your spice racks? They are from Ikea! Although, the last few times I've been out there, I can't seem to find them! I'm not sure if they were just out or if they've stopped making them...but good luck! How clever! I'm always putting my hair care stuff into drawers where it inevitably tips over and rolls around. I'll be trying this for sure! Hi Rachel, what an awesome idea! the bathroom looks chic and modern. However, as a pharmacist, i would definitely suggest NOT to store medications in the bathroom. From all the moisture and humidity in the air, the active ingredients can lose their effect. Could just buy plastic ones from hobby lobby. If one has kids. Did you do any prep work for your white spice cabinet, do I need to worry about shower steam if We put this in ?? My bathroom isn't necessarily small, but I do have counter issues :/ The counter top in the bathroom is beautiful granite, so I hate having stuff all over it. I love this idea!! I looked every where for the spice racks and I can't find them any where! I think IKEA must have stopped carrying them....I've looked my last few trips and I can't find them either. What are they thinking?? I just searched Amazon for this spice rack. Guess what? Ikeas spice rack is there along with many other styles. How funny that I came across your post via Pinterest, I purchased one of those spice racks at IKEA in their "as-is" section because I thought it would make a good jewelry hanger. Only I never knew what exactly it was I bought because it didn't have any packaging. Now I know it was a spice rack! I added small dowels (sp?) to mine to hang necklaces, and will hang bracelets on the long bar. Of course I have to figure out how to hang it differently. 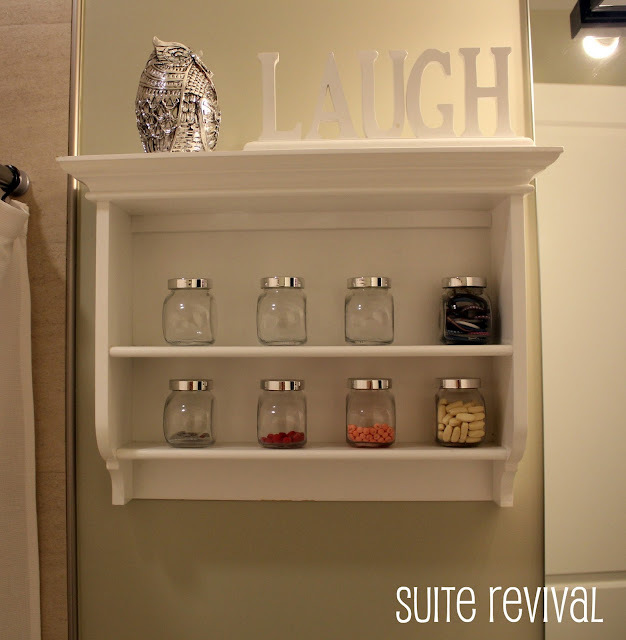 I also have a small bathroom, I love the spice rack idea. Thanks! I'm also borrowing. Your post shows that luxury does not always mean that it is expensive things in the bathroom. Thanks for sharing. The spice racks aren't discontinued... just a supply problem. My bathroom is also the laundry room so I have a storage issue when I go to Ikea I'm so getting some spice racks! Great idea! I love your bathroom and this idea! If you don't mind me asking, what color paint is pictured here? I also have a very small bathroom and am looking to repaint and I love this color! Love the spice rack holders....now I need to go find some. THanks for sharing. I love your owl! Thank you for the ideas! What a great idea. Couldn't find the ones you have but found these instead: http://www.amazon.com/gp/product/B0006B94Z0/ref=oh_details_o01_s00_i02. Just got it today. It looks great & is going to work just like yours do. They are chrome instead of wood. You may have already thought of this, but your medication jars may get moisture in them, try putting those little moisture absorbing cylinders from otc medication bottles in? Found this idea on Pinterest and went to Ikea and found the spice racks! We move next week and our master bath is sooo small and has no storage, can't wait ti use your idea!!! Thank you! I really love your bathroom. Nice ideas. meds in a bathroom not a good idea, because of the humidity! I was just thinking those spice racks would be great for my excessive nail polish storage! I have way too much nail polish that I keep in shoe boxes because I don't have enough space.....to Ikea!!! 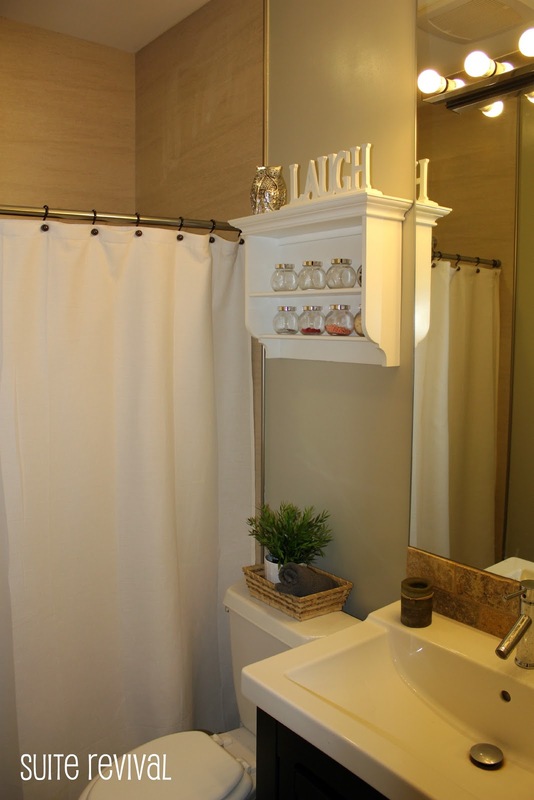 Your bathroom may be small but is really looks very well-maintained. I so like your ideas on the IKEA rack and the medicine bottles. These just made things more organized and saved up so much space. Thank you for sharing this post. Keep on posting! Thanks for the ideas. My bathroom is this exact layout and I was looking for organizing tips for over the toilet and also for the wall to organize toiletries. I really love what you did. It's inexpensive but appealing and tidy. Thanks, Fredda! I'm glad you were able to put those little racks to use!! 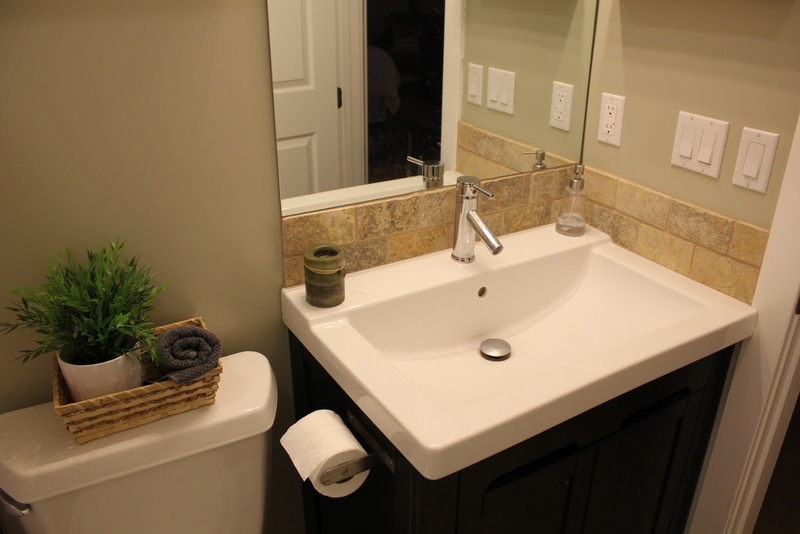 If you are remodeling a small bathroom, these small bathroom decorating tips will help you make the most of your space. Take time to plan before you begin remodeling or redecorating. Saw this on pinterest from another source.. http://pinterest.com/pin/120823202476351632/ and it has a watermark from dumpaday.com. Just wanted to let you know because I know you put work into this and I didn't want to pin the other image! Great post! I've been looking for some quality bathroom stores. What would you recommend? This is really cool, but you shouldn't store medication in your bathroom because it gets hot & steamy and destroys the medicine. Keep it in your kitchen or bedroom. I'm a copywriter for a storage company called MakeSpace. I'm currently writing an article on Ikea hacks. I'd love to include this post to show people how to use a spice rack from Ikea to organize toiletries. I'm emailing to request permission to use photos from this post. We'd link and credit your site, of course. Bathroom looks amazing! Love the pictures and the jars on the shelfs. Been thing of remodeling my bathroom and this definitely gives me some ideas. There is something wonderfully nostalgic about fitting two Antique Basin Taps rather than a mixer. This pair looks beautifully traditional and functional, but the warm brass is also bang on trend. Unlike a basin Antique Kitchen Taps, these sit up high, so there’s space to wash big pots and pans beneath..